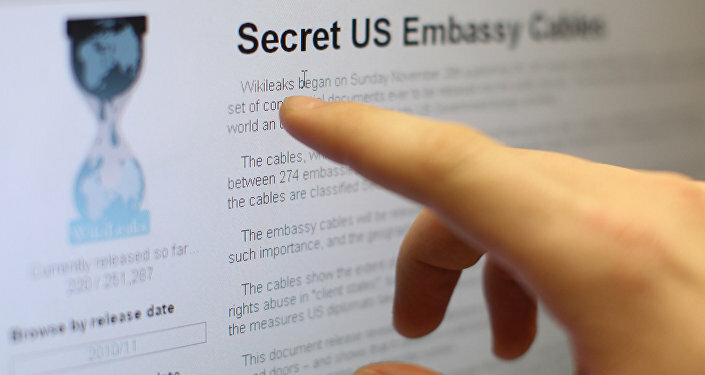 The US Senate is considering a bill that would reclassify WikiLeaks as a “non-state hostile intelligence service” as part of the 2018 Intelligence Authorization Act, which successfully passed the body’s Intelligence Committee in July. "It is the sense of Congress that WikiLeaks and the senior leadership of WikiLeaks resemble a non-state hostile intelligence service often abetted by state actors and should be treated as such a service by the United States," the relevant section of the act reads. The act passed the Senate Intelligence Committee 14-1, with only Sen. Ron Wyden (D-Ore) voting against its passage. On Tuesday, Wyden issued a statement explaining that the reclassification of WikiLeaks was the exact reason for his vote against the bill. "The use of the novel phrase 'non-state hostile intelligence service' may have legal, constitutional and policy implications, particularly should it be applied to journalists inquiring about secrets," Wyden said in the press release. "The language in the bill suggesting that the US government has some unstated course of action against 'non-state hostile intelligence services' is equally troubling. The damage done by WikiLeaks to the United States is clear. But with any new challenge to our country, Congress ought not react in a manner that could have negative consequences, unforeseen or not, for our constitutional principles. The introduction of vague, undefined new categories of enemies constitutes such an ill-considered reaction." The phrase "non-state hostile intelligence service" was coined by CIA Director Mike Pompeo in April in a speech before the Center for Strategic and International Studies. "WikiLeaks walks like a hostile intelligence service and talks like a hostile intelligence service," Pompeo said. "It has encouraged its followers to find jobs at CIA in order to obtain intelligence. It directed Chelsea Manning in her theft of specific secret information. And it overwhelmingly focuses on the United States, while seeking support from anti-democratic countries and organizations." Wikileaks, an international non-profit, has leaked 10 million classified documents from various governments including the United States. In 2016, they published numerous documents and emails from the Democratic National Committee (DNC) that suggested the nominally-impartial DNC deliberately tried to discredit presidential candidate Bernie Sanders over eventual Democratic nominee Hillary Clinton. After US President Donald Trump defeated Clinton in the general election, the US intelligence community claimed that WikiLeaks published the DNC emails on behalf of the Russian government, who allegedly hacked the DNC to discredit Clinton. Wikileaks denies that they have ever acted on behalf of a foreign actor. The US has been investigating Wikileaks for seven years since their 2010 leak of almost 100,000 State and Defense department secret files pertaining to US military action in Iraq and Afghanistan — many of them embarrassing to Washington. The source of the leak, former US intelligence analyst Chelsea Manning, was arrested and spent spent seven years in prison before former US President Barack Obama commuted 28 of her 35 year sentence, calling it "very disproportionate relative to what other leakers have received" and that "it makes sense to commute — and not pardon — her sentence." However, the US has never been able to charge a member of WikiLeaks for criminal activity. In April, Secretary of Justice Jeff Sessions said that the arrest of WikiLeaks head Julian Assange was a "priority." Assange is currently living in the Ecuadorian embassy in London, unable to leave for fear of being arrested. "We are going to step up our effort and already are stepping up our efforts on all leaks. This is a matter that's gone beyond anything I'm aware of. We have professionals that have been in the security business of the United States for many years that are shocked by the number of leaks and some of them are quite serious," Sessions told a crowd in El Paso, Texas. "So yes, [arresting Assange] is a priority. We've already begun to step up our efforts and whenever a case can be made, we will seek to put some people in jail." The Intelligence Authorization Act is meant to assure two things: firstly, that all secret and clandestine operations are signed off on by the president, and secondly, that Congress is made aware of the operations.